On the top you have the function bar, with the "write here"
The green rectangle is the cell. You can see its name on the top left. TIP: You can enter any text in the top left cell and this will become the name of this cell. It can be recalled later. The Fx stands for Excel Function or Excel Formula and is here to enter a formula. You can try it now or we will see it in a few chapters when we talk about Excel Complex Operations on Numbers..
On the bottom, you can see the wording Sheet1, Sheet2, Sheet3. These are 3 different sheets you can use to enter your work. 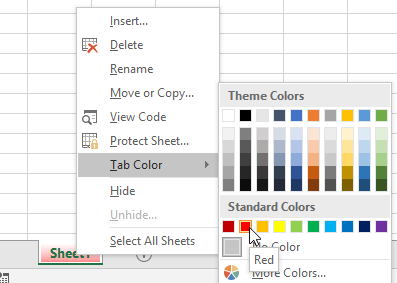 You can add sheets by pressing the PLUS button and also rename them (by double clicking on the them). You can also change their colour by right clicking on them like this. You can also move the sheets between each other by dragging the tabs of the sheets to the left or right. Look at the tips and trick to make your life easier. 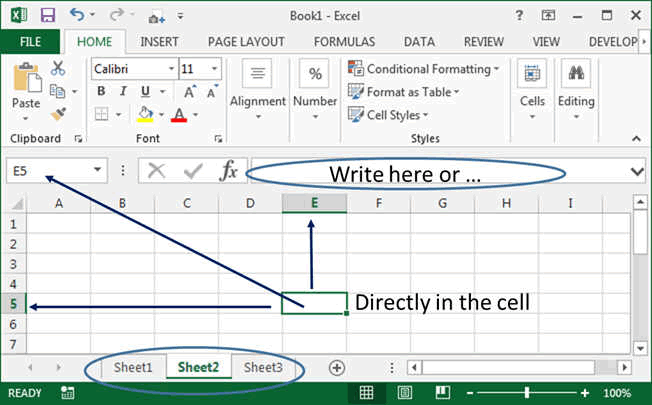 How to move around in the spreadsheet. That's it for the moment. Now you will learn by doing.